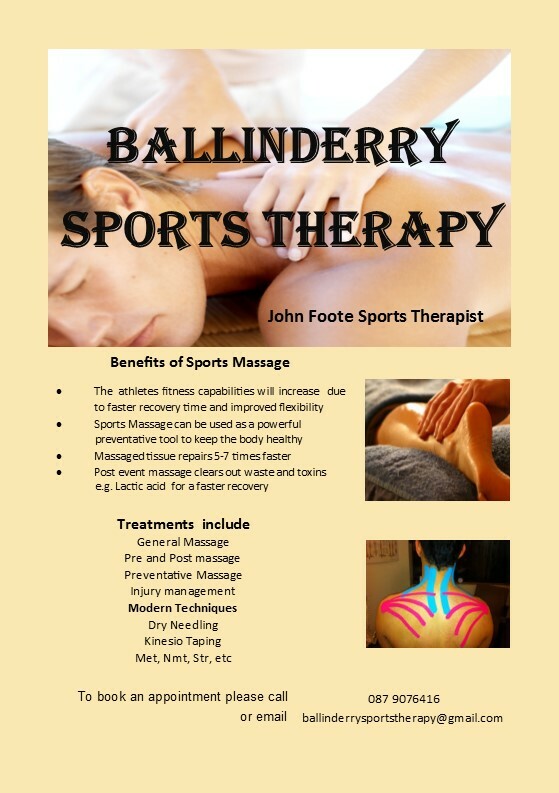 Club member John Foote has launched Ballinderry Sports Therapy which caters for all types of massage and sports injuries. He of course caters for non-sports related treatments too. Having gained valuable experience with local team Visit Nenagh DMG in the 2014 Rás, John is hoping to specialise in cycling specific problems and the role bike fit has to play therein. John is at present continuing his studies at The Institute of Massage and Sports Therapy in Annacotty and hopes to graduate in level 4 there in June 2015. John is offering special rates to all North Tipperary Wheeler members so please do give him your support if you are looking for this type of treatment. You can call him on 087 9076416 or email him on ballinderrysportstherapy@gmail.com to book an appointment.